Soup has always been one of Bill Kim’s strong points, and though Urbanbelly's are mainly Korean flavored, this is a pretty traditional and well-made Japanese bowl, lighter on spice than it looks from the red oil on top. 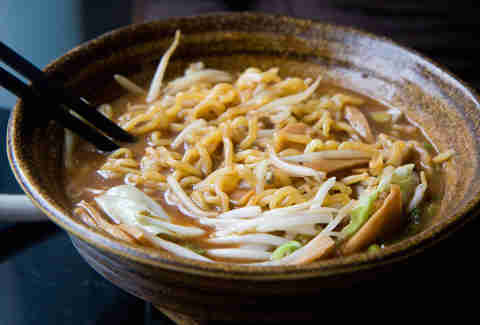 The only thing is, it’s curiously sweet for ramen, too much so for our taste. The crinkly, toothy noodles are very good, and as you might expect from the name, so are the bacon-y slices of pork belly. 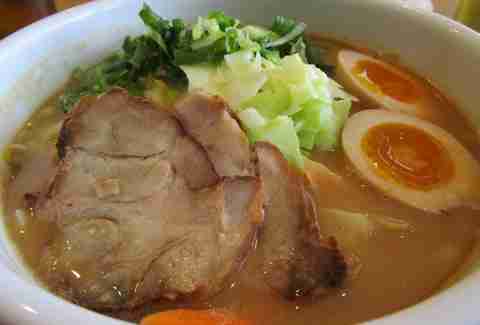 Come to Takashi Yagihashi’s ramen joint for the porky Tonkotsu with with bok choy, egg, naruto and chili oil. The noodles, made in-house, are excellent, and the accompaniments are pretty (though the broth is on the salty side, thus, 14). This Lakeview “Asian street food” spot has several types of ramen, starting with a pretty tasty pork tonkotsu broth and chewy noodles in a nice, if slightly smallish, bowl. While it may not win the prize for "Best Ramen," it could take what’s arguably an even more important title: "Best Ramen That GrubHub Will Deliver in Lakeview." A ramen place opened in the middle of Lincoln Park in the midst of Chicago’s ramen fever, and nobody noticed? Hard to believe, but it’s true. 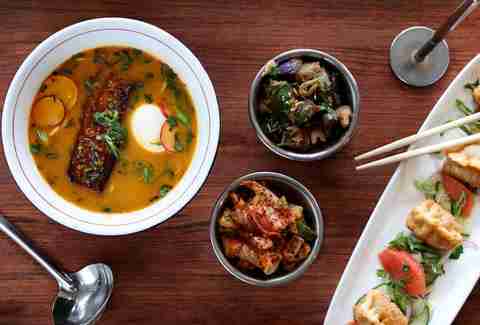 This tiny year-old Korean-Japanese joint serves nice sushi and comfy dishes including a tonkotsu ramen that’s a little thin, broth-wise, but full of high-quality accoutrements. 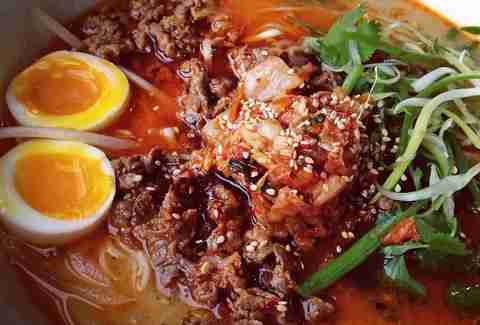 It’s enough to make us want to go back to check out the seafood and Korean-style beef ramen, too. A few years ago this might have been the best and most authentic bowl of ramen in the city. It looks the part (we especially like the gooey egg), but the broth doesn’t quite have the unctuous porkiness of the best places that have sprung up in the last couple of years. Still, give it props for being a traditional, no-funny-business bowl. There are various modernist takes on ramen on the menu here, but the traditional Oiimen is a great, classic bowl with lots of deep porky flavor -- which unfortunately is immediately masked by the presence of a pungent garlic oil sprinkled on top. Get them to leave it off, or at least use a light hand, because this is a pretty fine bowl without it. Hidden in a half-empty strip mall (the sign actually says “Sushi & Grill”), this tiny spot features very little English and does a variety of authentic Japanese lunch dishes like grilled mackerel, as well as a nice bowl of ramen with cloudy, porky broth, toothsome noodles, and a really fresh-tasting garnish of green onions and shaved radish. 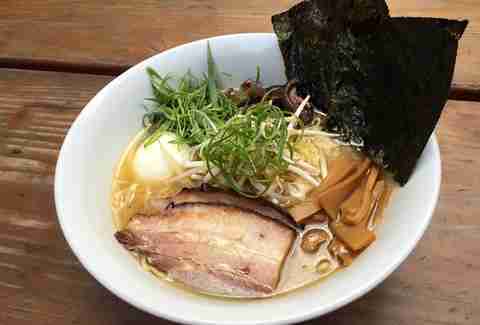 And at $9.75, it takes the “Best Ramen Under $10” prize on this list. 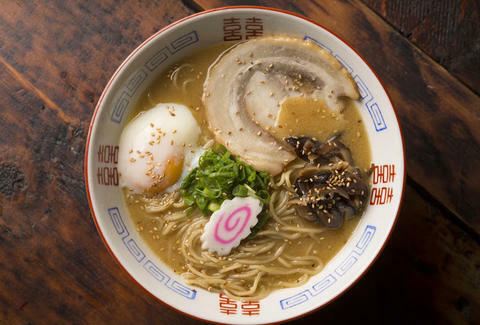 The latest authentic ramen joint to pop up in a Northwestern suburban strip mall, Shinchan offers a well-made bowl, though the tonkotsu broth is not as thick and unctuous as some of the others out this way. 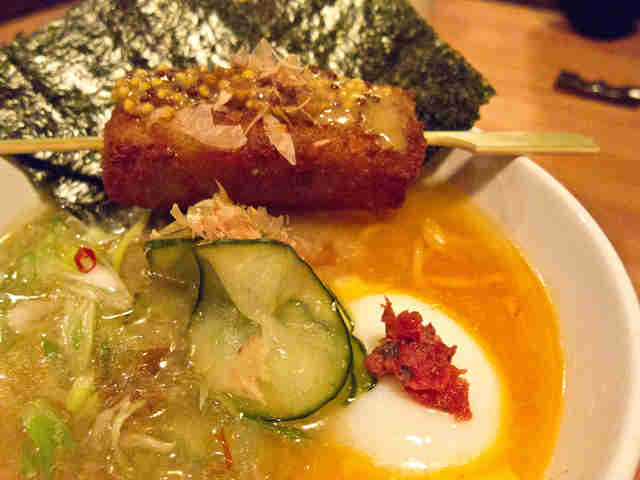 Yusho’s Logan Poser Ramen was one of the first signs of the hipster ramen explosion to hit Chicago, and remains the star of the Sunday ramen brunch. To be honest, though, the ways it broke with tradition (like the meats on a stick that came with it) were tastier than the ramen itself. Now labeled Logan Poser Ramen #2, it’s been refined with a richer, porkier broth (under a spicy sesame oil slick), and the pork/fish ball that comes with it is fantastic, making it one of the best unorthodox bowls around. When this Japanese ramen chain opened an outpost at the Mitsuwa Market in this Northwest 'burb, it was hailed as the most authentic ramen to hit Chicago to date. 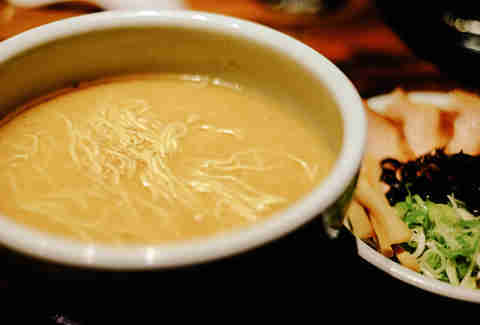 After that hype, we expected a deep, almost gelatinous broth, but it isn’t quite that -- it’s a fast-food bowl at heart. It’s very good, but to get to great, you’ll definitely want to spring for the $3 add-on of the incredibly velvety and supple pork cheek -- sheer piggy magic. With two-hour lines out the door every night, Brendan Sodikoff's tiny 16-seater, beneath his Green Street Smoked Meats, has become the epitome of hipster ramen trendiness. But dammit, once again his restaurants live up to their hype. The tonkotsu is dark and funky, a lowdown, dirty broth (if a little too salty), and the noodles are fantastically chewy, almost wiry. Note that spicy is the order of the day -- a half-spice bowl is plenty hot, and the spicy is reputed to be genuinely punishing. 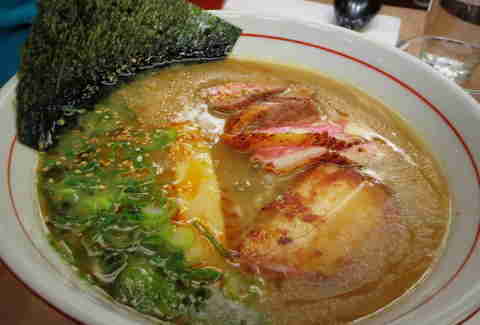 Sibling to Wasabi, but a more serious place, dedicated not to tonkotsu but to a soul-nourishing thick chicken paitan broth, which you can get in various permutations -- spicy, crossed with shoyu, or a singeing-hot miso (see the picture). The chicken broth is excellent, though the noodles seemed a little soft compared to some of the others we’ve had. Last year when Strings made #1, we heard from some who thanked us for recognizing it when other critics didn’t -- and others who thought we must be on the take. Well, we tried it again and we remain convinced how right we were the first time: the tonkotsu broth, from Berkshire pork bones boiled for 48 hours, is as thick and tasty as a pork milkshake, and we love the springy, slightly chewy noodles. 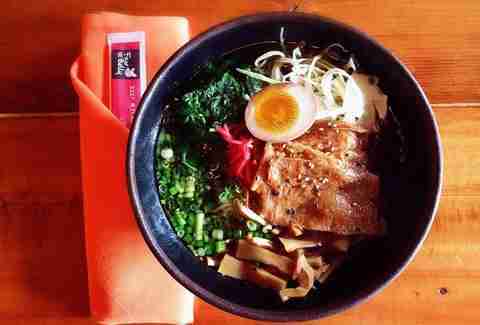 Located in a modest strip mall on a nowhere stretch of a Northwestern suburb, Misoya looks like the ramen version of a diner -- but don’t let the lack of pretension trick you. If ramen-mania is starting to bug you, the no-bull way this place dishes out its different types of ramen -- tied to different parts of Japan (from Hokkaido chashu to spicy Tokyo), each impeccable for its own category -- is the antidote to excess ramen attitude. And add in this good news for city dwellers: it’s coming to Streeterville sometime in the coming months. 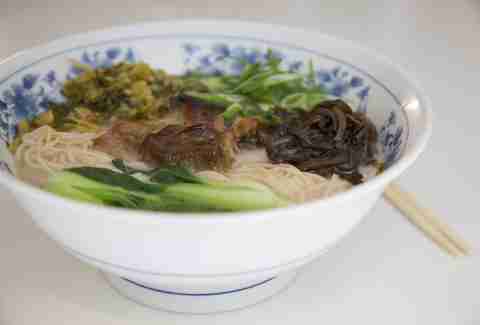 Is the thickest, porkiest bowl of tonkotsu ramen the most authentic? 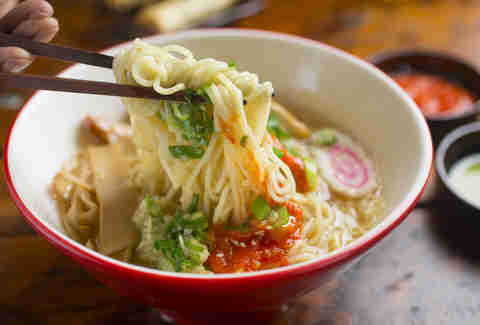 Or is it more like the best classic-French-technique bowl of ramen? You could make that case, but either way we’re pretty much wowed by Shin Thompson’s tiny, furiously busy ramen bar, with its lush, soul-filling broth and chewy noodles, enough so to declare it our new champion. And though many don’t like it, we think the giant soup spoon is funny. Mike Gebert is a James Beard Award-winning food video producer and writer, and founder of SkyFullofBacon.com. Follow him on Twitter: @skyfullofbacon.